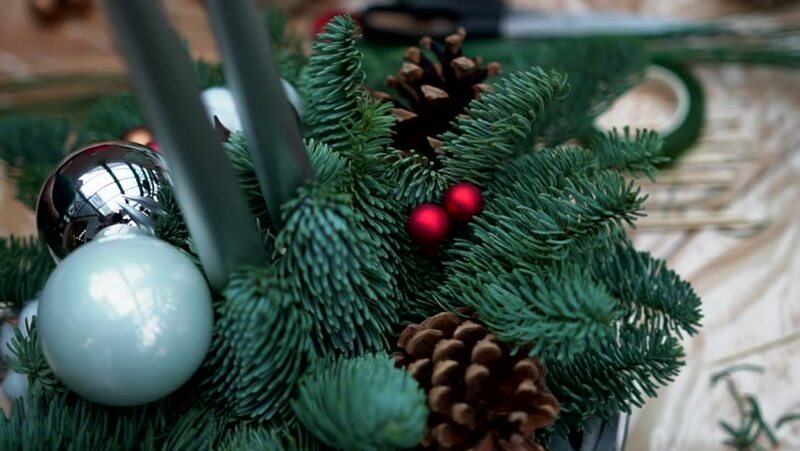 Christmas arrangement: pine tree, pine cones, taper candles, christmas tree toys and cotton flower balls in wicker basket on plastic wrap, close-up. Supply for handcrafted decoration on wooden table. hd00:05Christmas arrangement: pine tree, pine cones, taper candles, christmas tree toys and cotton flower balls in wicker basket on plastic wrap, close-up. Supply for handcrafted decoration on wooden table. hd00:11Christmas composition: fresh pine tree branches, pink christmas tree toys and cotton flower balls in gift box on plastic wrap. Craft supply for handcrafted decorations on wooden table, close-up. hd00:16Christmas composition: pine tree branches, pink and silver christmas tree toys and cotton flower balls in gift box on plastic wrap, close-up. Craft supply for handcrafted decorations on wooden table.